Dina El-Damak is an Assistant Professor of Electrical Engineering at USC and a holder of a WiSE Gabilan Assistant Professorship beginning August 2016. She received the S.M. and Ph.D. degrees in Electrical Engineering and Computer Science from the Massachusetts Institute of Technology (MIT) in 2012 and 2015 respectively under the supervision of Prof. Anantha Chandrakasan, and the B.Sc. and M.Sc. degrees in Electronics and Electrical Communication Engineering from Ain Shams University, Cairo, Egypt. After receiving her doctoral degree, she spent one year as a postdoctoral associate at the MIT’s Microsystems Technology Laboratories supervised by Prof. Anantha Chandrakasan. Her research interests include energy harvesting, power management circuits, autonomous systems, ultra-low power biomedical devices and circuit design in emerging technologies. She has published in major conferences and journals in the field including ISSCC, VLSI Circuits and Technology, IEDM, JSSC. Her research work was featured by several media outlets including MIT News Office, CNBC, and Electronics Weekly. 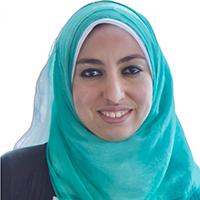 Dr. El-Damak was featured as one of the women rising stars in EECS in 2014 at UC Berkley. During her undergraduate studies at Ain Shams University, she was the recipient of annual academic distinction award (2003-2007), and she was the recipient of a full-scholarship throughout her M.Sc. studies. She was the co-recipient, among the executive board members of the MIT Egyptian Student Association, of the MIT Bridge Builder Award (2014), the MIT William Stewart, Jr award (2014) and the MIT Golden Beaver Award (2015). She was the recipient of Texas Instruments Graduate Woman's Fellowship for Leadership in Microelectronics for the academic years 2012-2013 and 2013-2014. Energy harvesting, power management circuits, autonomous systems, ultra-low power biomedical devices, circuit design in emerging technologies. 2015 Rising Stars in EECS – Invited Participant at UC Berkeley. 2015 MIT MTL Annual Research Conference (MARC) Poster Presentation Award - Circuits and Systems Track. 2015 MIT MTL Annual Research Conference (MARC) Featured Talk Award. 2015 MIT Golden Beaver Group Award - Student Leader Awards, Co-recipient among the MIT Egyptian Student Association Executive Board Members. 2014 MIT William L. Stewart, Jr. Group Award, Co-recipient among the MIT Egyptian Student Association Executive Board Members. 2014 MIT Bridge Builder Group Award - Student Leader Awards, Co-recipient among the MIT Egyptian Student Association Executive Board Members. 2014 Texas Instruments Graduate Woman’s Fellowship for Leadership in Microelectronics for the academic years (2012-2013, 2013-2014). 2007 Faculty of Engineering Ain Shams University: Annual Academic Distinction Award (2003-2007). 2007 M.Sc. Scholarship by Faculty of Engineering, Ain Shams University,Egypt (2007-2010). 2007 Best Technical Paper Award, Mentor Graphics Higher Education Program Workshop, Egypt (Co-author).